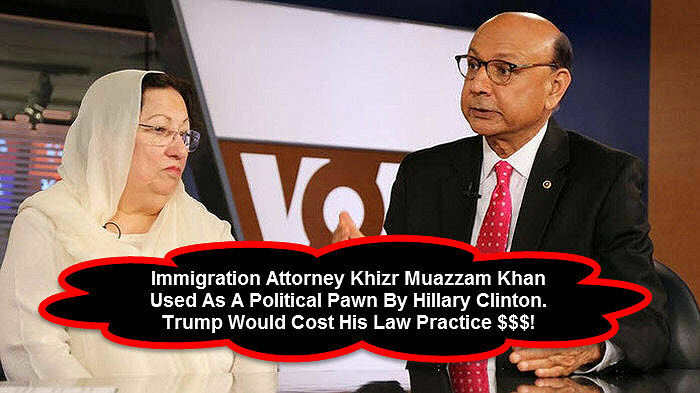 Hillary Clinton used Khizr Muazzam Khan as her personal political stepping stone to attack Donald Trump. But thanks to several bloggers we know now that Khan is an Immigration Attorney, who will lose money when Donald Trump is elected. It was typical for left wing media to leap all over this story since Clinton played the Star Soldier card at the Democratic National Convention. Trump reacted as usual after being slammed by the dishonest media supporting Clinton. However Khizr Muazzam Kahn is the looser in this battle. Hillary Clinton literally through him under the proverbial bus so to speak. Now everyone knows his name. And they also know his business is Selling America to Muslims via Visas and other legal services related to immigration. It has been said that Kahn took his website offline, but the sites url is returning a 301 Service Unavailable error. Considering the site is hosted by GoDaddy and built with a do-it-yourself site-builder, chances are the traffic exceeded the hosting plans allotment. Good reason for the 301 error. Google cache of www.kmkhanlaw.com is here. Khizr Khan may be a fine American and the father of a true American patriot. But now he is also everything that is wrong with American politics today. It is not entirely his fault, though he has only himself to blame for allowing his dead son to be used for the most hideous of purposes and dragged through the gutter of nasty and dishonest partisan politics. Maybe our fearless leader Donald Trump shouldn’t have swallowed the sucker bait Crooked Hillary cast out. Lets get some good TV ads running exposing crooked Hillary Clinton as the Liar and true Scumbag that she is. As usual.. Just my two cents worth! Hillary Clinton is a despicable individual who will use anyone to win. Hillary Clinton and Barack Obama are really worried. They know Donald Trump is winning and that scares them both to death. Clinton Campaign is manipulating the media and telling lies about Donald Trump. But never fear, Trump will be our next president come November 8th.